Apparently not everyone has gotten the memo that the Egyptian Government wants to PROTECT the Copts – sectarian attacks continue. Copts, by the way, are the native descendants of the Egyptians of the eras of the Pharaohs – they number anywhere from 5 to 10 percent of the population. Religion is still on one’s identity card, no laws have been passed to ease religious restrictions, and every week there is some attack against Christians in Egypt, from harassment to murder. Authorities in Egypt reportedly raided a church-owned building that was being used by a local Coptic Christian community for worship and chained down the doors so that Christians could no longer enter the building. According to a press release shared with The Christian Post by the human rights and religious freedom advocacy group International Christian Concern, the three-story building situated in the village of Saft Al-Kharsa in the Beni Suef governorate was broken into by police officials last Friday. The press release notes that the building had been used by the local Coptic Christian community as a church and a community center. The local Christians have tried to have the building legally recognized as a church since 2016 but have faced backlash from radical Muslims and resistance from the government. The incident shows how Egypt’s Copts are not only facing the challenge of Islamic State militants, who have vowed to “wipe them out”, but also the daily challenge of living in a country where their constitutional right to freedom of belief and expression is challenged by their Muslim neighbours. According to Coptic news site Watani, the local priest in Saft el-Khirsa, Fr Thomas Bibawy, has demanded that the Interior Minister conducts an urgent investigation into the incident, while the bishopric has frozen its membership of Beit el-Aila, an interfaith group headed by the Grand Imam of Al-Azhar. The right to freedom of belief, as well as expression, is enshrined in Egypt’s constitution, but Copts who wish to practise their faith in a church building face an uphill battle. It is almost impossible for Coptic Christians to obtain a license to build a church. In Saft el-Khirsa, a town of around 12,000, including approximately 70 Christian families, there are ten mosques but no church. And Saft el-Khirsa is far from unique; similar situations can be found across the country. The Copts here have used their building as a community centre and sometimes also as a place of worship, though whether they have permission to do so is unclear. In November last year, they applied for a license, but there has been no official response, nor any indication when they might receive one or what would help their case. Previously, in July last year, the Copts in Saft el-Khirsa were the subject of a violent attack over rumours they were building a “house church”. Coptic homes and stores were pelted with stones by angry crowds, shouting “We don’t want a church”, and “No god but Allah, Christians are the enemies of Allah”, according to local witnesses.In a similar case last year, Copts in Koum al-Loufi, Minya, were attacked and four of their houses set on fire by local Muslims following a rumour that one of the houses was going to be turned into a church. The Catholic website La Croix points at the the importance of education, saying “the lack of education, as well as its corollary, the teaching of conservative thought, is … blamed for being the vector of rampant extremism”. Could the same be true of sectarianism in general? Influential clerics like Sheikh Ahmed al-Naquib teach that “it is forbidden to build churches in the lands of Islam. This holds true, even if the ruler allows otherwise”. Meanwhile, a young student of Al-Azhar University, a global centre for Sunni thought, admits that he “was taught to believe that Muslims were superior to Christians”, adding that “certain lecturers even taught that killing a Christian was not a crime”. But in an official statement issued on 18 April, Al Azhar said “Sharia prohibits every kind of assault against human beings, regardless of their religion and belief”, and “Islam also binds Muslims to protect all places of worship and to treat non-Muslims with kindness”. Double standards? Salama, a professor at Cairo University, says “the Islamisation of society in Egypt has led to a turning inward by the Coptic community itself, which has also had consequences”.”The public sphere has become Muslim and today we are witnessing double-standard justice,” Salama says. Salama compares reactions to two recent incidents to make his point. On the one hand, a group of young Copts were last year sentenced to prison and eventually fled the country because they had made a video mocking Islam. But on the other, Salama notes, “After the [bus] attack in Minya, some internet users posted hate messages, rejoicing at the violence against Christians. But these were not prosecuted even though the law punishes such behaviour. Such impunity weakens the Copts”. It is important to reiterate that Coptic Christians have been targeted for deadly religious violence throughout history, particularly during Emperor Byzantine’s reign and occasionally after the Muslim conquest around 641 A.D. In 1000 A.D., an Islamic caliph is reported to have destroyed at least 3,000 Coptic churches and forced an unknown number of Copts to forsake their faith. This sectarian violence has continued throughout the years, with Coptic churches throughout Egypt being targeted by suicide bombers and gunmen. 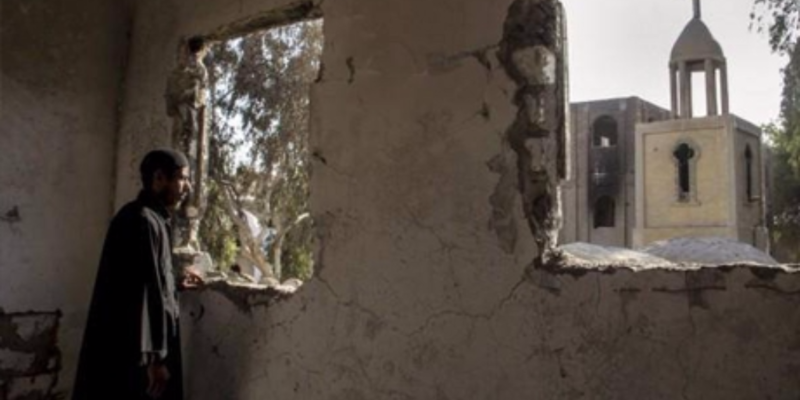 Homes belonging to Coptic Christians have also been set on fire and their proprieties looted. While these attacks are largely associated with the ongoing global campaign against Christians by international Islamic terror groups, such as ISIS, continued attacks on Copts in Egypt have also been blamed on a lack of adequate political representation. Currently, the Egyptian Parliament has only 36 Christians out of 596 members, and 24 of the Christian representatives were given the seats through a religion-based quota system. When it comes to legal protection, the Egyptian law leaves Copts exposed to sectarian attacks since it declares Islam the state’s official religion and prohibits conversion to any other religion. There is also the Blasphemy Law, which has seen many Christians in the country jailed for speaking against Islam. Although the Egyptian government has often strongly condemned these attacks, no decisive action has been taken against the perpetrators. Now the question that everyone is asking is, for how long will innocent men, women, and children continue to die because of their faith?